This has been a tough school week. I've got a project due this week and my reading was 40 detailed pages on Piaget and Vygotsky. Sometimes, child development kills me! Add to this the fact that I'm still catching up from the 40 rows I had to rip on the blanket last week, and my time at the gym. I'm still working on the whole 'balanced life' thing and I've got to say...I'm way less productive, lol. But I feel better and I'm off of the energy drinks. Saturday we went to a birthday party for my great-nephew and then to the gym. We were out all day long, and when we got back I was exhausted. I wanted to take a nap and then start work again on my project, but I passed out and my husband woke me up to send me to bed a midnight. Then Sunday I pulled my neck out and spend the day hobbling around like an 80 year old, in major pain all day. Today I woke up with better range of motion, but Alex got up with a racing heart and got sick so I had to take him up to the pediatrician to have some tests done. This is the second time this has happened in the last few months and we think he might be having some trouble with hypoglycemia. He was a real champ about having three vials of blood drawn, and we're celebrating by letting him play some Kinectamals. It's that super cute game with baby jungle cats that play with you and respond to what you do. It keeps him busy, and all the body movement helps him burn off some energy. I only let him play once every few weeks as a special treat, and today seemed like a good day for it. So now, I'm working on the reading for my other class and I got antsy so I decided to take a quick break and upload a photo of the socks that I'm knitting for my brother-in-law. 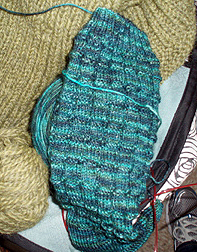 I'm using Play at Life Fiber Arts Boundless Sock in a one-of-a-kind colorway that's perfect for my brother John. I love this yarn! The colors are fantastic and the stitch definition is amazing. The yarn feels nice in your hands as you knit with it, even when knitting tight stitches, and I happen to know that the yarn is truly colorfast. No bleeding at all when I washed my swatch! My buddy Chrystee is the genius behind this yarn, and if you haven't done so yet, then you need to run right over and check out her etsy shop. You might remember her yarn from my Night of the Lepus design. This is going to be my second design in her yarn, and for a compulsive yarn/pattern jumper like myself, that's saying something! Ouch, I hope your neck is feeling better! Alex too.